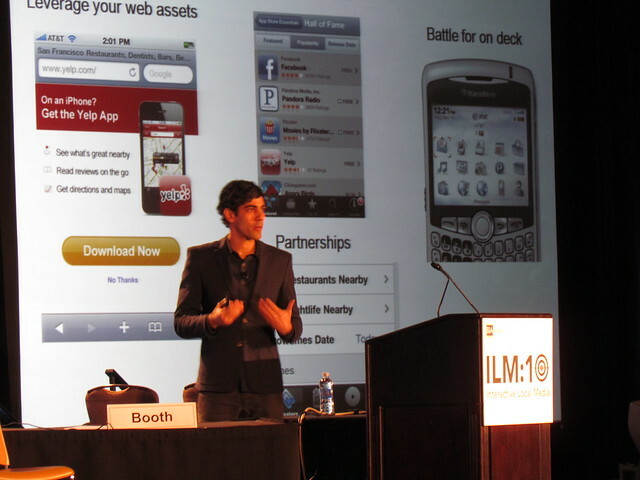 Yelp CEO Jeremy Stoppelman, in his opening keynote at ILM:10, noted a general frustration with Google’s apparent de-emphasis of Yelp’s content, but said he sees major opportunity in mobile app access as a workaround of Google. Stoppelman showed an example of a 2007 search that showed the vast majority of results coming from Yelp. “We loved 2007,” he said. A current search has only one Yelp result, although it is on top. The rest come from Google Places, which Stoppelman notes is linking to Yelp, but only waaay at the bottom of the screen. As for monetization, Stoppelman said he is especially excited about providing listings with video. Local search ads on a click-per-call and CPM basis are a big part of Yelp’s revenues also. Stoppelman also sees Yelp’s Weekly deals, currently in eight cities, as holding significant promise.